make your dreams come true too! 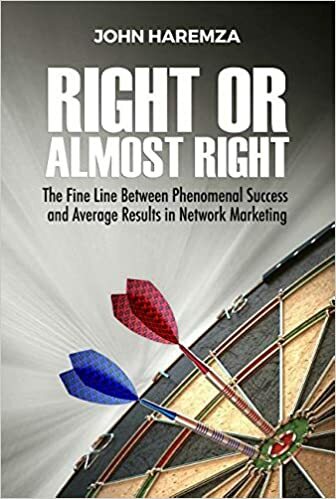 Right or Almost Right is a how to book by a successful network marketer offering guidance for those interested in or currently working in this field. It offers a focused, positive and clear message on how this type of marketing works, what it's advantages are - wealth creation and free time - and what it takes to be successful, step by step. The author offers an easy to read writing style that will work well for busy entrepreneurs who need to fit these lessons into their few quiet moments. I love when an author of this type of book shares his/her personal story first. Who are they and where they have come from are their credentials. Their story offers the reason WHY I should listen to what they say. Haremza struggled in school because of his Dyslexia and was working as a maintenance manager when he began his journey in network marketing. His is truly a rags to riches story. Want to know how he changed his life? It's all here in the pages of Right or Almost Right. pursuing your dream is infinitely less than the cost of letting your dream die. The cost of neglect is far, far greater than the cost of discipline."